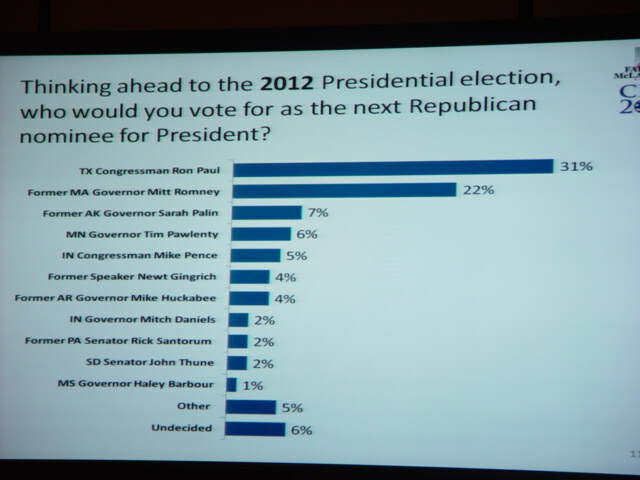 CPAC Live Blog – Straw Poll Results | Virginia Right! Over 10,000 attendees voted in a straw poll. With Glenn Beck up next, they announced the results of the vote. CPAC attendees had their credentials punched when they voted, so there is only one vote per person. 50 States participated plus Washington D.C.
48% of the voters were students. 80% said individual freedom and size of government were the most important thing. 5% more than last year. I heard a different take on that poll.. that it was heavily voted on by students. That only about 25% of those attending voted.. What's your take on it Tom? You are absolutely correct. with over 10,000 in attendance, around 2,300 voted on Thursday and Friday. Of those that voted, 48% were students. There were a lot of students there, and young people. But I think that was oversampled. The 3 days were so packed with speakers and smaller sessions that it was hard to get to the exhibition hall where the Straw Poll booth was located. Ron Paul has some good ideas, but in my opinion, the bad ideas (foreign policy, drugs, etc.) put him on my "not acceptable" list.I was speaking to a fellow blogger and she put it quite well when she said "I like a lot of Paul's ideas, but I can't stand his followers".Paul was on top, but I still think Mitt is the one to beat at this point. Pawlenty is great, Pence is amazing. I love Palin, but I think her negatives, while mostly lies, will work against her to energize the Democrats.But with just under two years until the primaries, I keep reminding myself that Obama, Bush, and Clinton were not even on the radar at this point. Bob McDonnell could even be a possibility. A McDonnell – Scott Brown ticket would be hard to beat. See….that might well be “The” snapshot of what’s wrong with the movement. Ron Paul? Please. While I agree with lots of his constitutional arguments, there is little else to the package. His outlook on Iraq and Afghanistan is Isolationistic. Whether we engage them, or not…..these folks WILL continue to try to kill infidels. Anyone who isn’t familiar enough with world history has missed the expansion of the Muslims that was only stoppped by the formation of and execution of the Crusades. This is the second,and arguably, the third time we’ve had to turn back the radical elements of Islam, and we’re failing miserably at the overall effect. We’re punching them here and there, but it’s really whack-a-mole….when viewed in context to the Crusade Efforts. As for the Federal Reserve….you begin to play with the market stability, just like the Dems are doing right now. Spend the time to talk to economists and activists, and develop a plan to phase out the Reserve, while insuring that the impacts do not undermine the markets in America at the same time. An abrupt end of the Federal Reserve will have the same effect as turning all of the terrorist detainees in Cuba loose at the same time. The “surge” that it would give Al Queda would be a blinding one as those combatants take “lessons learned” back to their opposition bases. Mitt Romney has done well on these things, and but for his flip-flops of the past on abortion, I would say he’s solid enough. At the end of all this, I think McDonnell will be in the number one day. If he has a superior term in Virginia, he’ll actually make a great President someday. You are absolutely correct. Political Correctness is the friend of those who would do us harm. Today’s atmosphere makes it so that even the mention of the Crusades brings down the liberals on you pretty hard. The same ones that hid behind Republicans and Conservatives after 9/11. They talk a big game until she sh^& hits the fan. I have the video of Ann Coulter’s remarks and she addressed Ron Paul and also spoke about him in answer to a question. I will post that later today (in recuperation mode this morning). But I will say that the straw poll results are always off. Interestingly, with over 10,000 people in attendance, only about 1/4 actually voted in the straw poll. The largest voting block was the 48% students, who seem (to me, at least) to be very much in Ron Paul’s camp. Coulter summed up the Ron Paul thing pretty well. I will screw it up if I try to post her comments from memory. Well, Rachel Maddow was there and a number of liberals looking for something negative to say. I am sure they were allowed to vote. I had press (bloggers) credentials and that was allowed. Interestingly, during the poll results talk, the speaker said that he would like to meet the 2% that thought Obama was doing a good job. Did the 2% said they approve of Obama or was there a “No Opinion” or “Not Sure” option? Nodding in agreement….I’d have liked them to identify themselves, so we’d know who was with us, and who was not.